Coverage: BBC One, HD, Red Button, Sport website and Radio 5 Live. 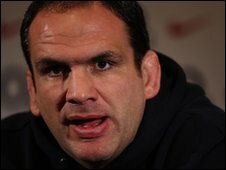 England team manager Martin Johnson has hit back at his former team-mate Lawrence Dallaglio over claims that he intimidates the current England squad. Dallagio claimed many current players are so in awe of Johnson that they are unwilling to question his decisions. But Johnson insists Dallagio's view of the situation is wrong. "It takes time for players to find their feet in Test rugby. You are not going to come into a squad and start challenging people," he said. Dallaglio, who played alongside Johnson in the 2003 World Cup-winning team, also told the Times newspaper that England need to be more player-led and less coach-driven. "Players need to step up and say 'it is Saturday. Now we are in charge'." Johnson has had eight defeats in 14 Tests since taking over in 2008, including against Australia and New Zealand in the autumn Test series. But he insists that injuries to the likes of full-back Delon Armitage, centre Riki Flutey and number eight Nick Easter, who all return for Saturday's Six Nations game against Wales, have hindered them. "A little bit of the frustration of the autumn is when you lose guys like Riki Flutey and Nick Easter and Phil Vickery and Andrew Sheridan so you haven't got those veterans there whose role it is to do that [challenge the coach]," Johnson explained. "The inconsistencies of not having guys there through injury, although the next guys are good players, means you lose that relationship and that chemistry that builds up. It takes time." Johnson, who as England captain enjoyed a successful relationship with his coach Clive Woodward, added: "We'd been together six or seven years, you know what people are like and you can have those strong discussions. "We've had some pretty open and frank discussions in the last month with the players. That's great."